A love for grilling is the reason many people step outside into their backyards, or on their decks, patios, or balconies. Grills and outdoor kitchens make nearby dining tables a necessity, at least during the warmer months of the year. Whether your outdoor space is a city balcony or a sprawling ranch with enviable acreage, dining outdoors is a much-anticipated ritual and pastime during the summer and warmer months of the year. Take a cue from restaurants that turn sidewalks or courtyards into outdoor cafes at the first sign of spring. It's one of life's simple pleasures. Transforming your backyard or patio into a dining area ​involves very little effort—just common sense and planning. Follow these design ideas and tips to enhance the experience for you and your guests. If your yard is a balcony or another kind of limited outdoor space, the location of your dining table and possibly a grill is pretty much decided for you. A bigger yard means you have more choices, although you'll want to consider a few important points before plopping that granite table out under the faraway oak tree. 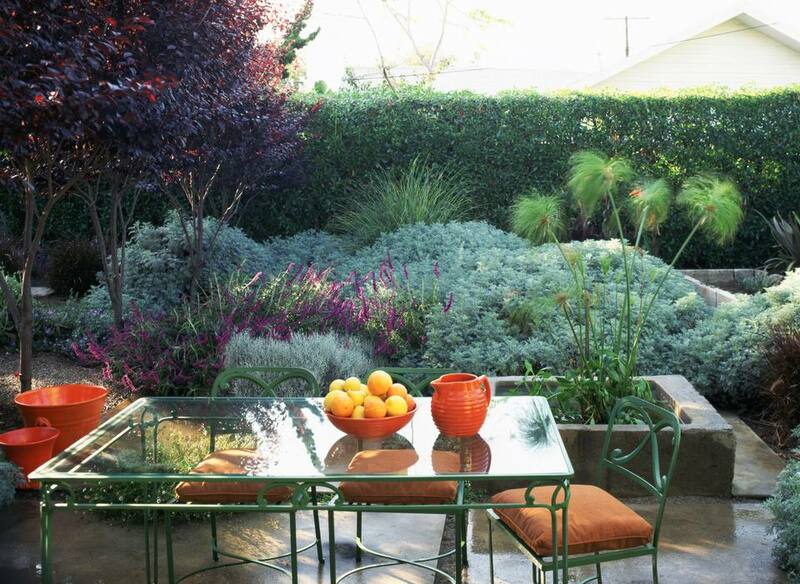 If the kitchen is indoors, it's a good idea to locate the outdoor table not too far away, for easy access. Make sure the table isn't too close to the charcoal barbecue or smoker. Give guests room to move between the outdoor kitchen, dining table, and buffet table. Carving out the right area for an outdoor dining table should be viewed as an opportunity to design a space around your lifestyle, rather than designing your lifestyle around the space. 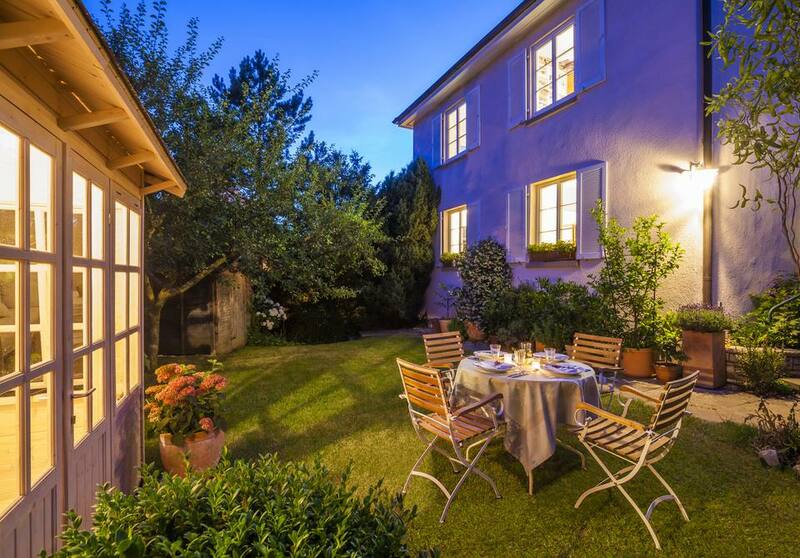 Dining outdoors and entertaining guests is one of the true joys of having a home and yard. Near the outdoor kitchen or grill makes sense, although you don't want to be downwind of a charcoal barbecue or smoker. If meal prep will take place inside, you want the table to be located nearby. Just maybe not butted up against the outside kitchen wall. During the summer, outdoor walls can get really hot—like fry-an-egg-on-a-vertical-surface hot. Select a site near a door for easy in-and-out access. Think about quick trips to the kitchen and bathroom. A buffet table or bar is a handy way to allow guests to serve themselves, goes along with the informality of the outdoor dining experience, and frees up space on the dining table. Make sure there's enough room to accommodate both guests and the buffet table or bar without crowding. The rule: about 4 feet between the buffet table or bar and the outdoor dining table. You want your guests to have a good time. But if someone gets louder when they get more relaxed (libations), will the patio table be near your children's bedrooms? Will the noise carry if you locate the dining table next to the fence dividing your property and your neighbors? Devise a layout that will make everyone happy. Depending on the occasion, you can get as informal or fancy as you want. Outdoor tablecloths are festive and can hide an imperfect table. Outdoor tableware is a more eco solution to paper plates and can be used for several years. Patterns and solids are usually made of melamine—but not your grandmother's Melmac. Plastic utensils can be washed and reused, or you can use the regular stainless or silver if you prefer. Choose drinkware made for outdoor use. Broken glasses can be a mood killer. You can have the most expensive, gorgeous outdoor dining table in the land, but if it's sitting smack-dab in the middle of a concrete patio in the desert with the sun beating down, nobody is going to care. Provide shade and shelter, in the form of outdoor umbrellas, shade cloth or sails, or a gazebo. If you have a roof over your deck or patio, you can dine outside any time of day. Otherwise, you can shade the dining table with a patio umbrella or use a pergola with a tent-like roof. Another idea: dine when the sun goes down, and you won't have to worry about supplying shade. What's the view like from your yard? If you live on a hilltop, the world below will look dazzling at night while gazing at it from an outdoor dining table. How about any views within the yard itself? Do you have a lovely garden, a pool, or a nicely illuminated water feature? Locate a dining table so you can enjoy the amenities in your own landscape. Maybe your house has lots of windows, and, when softly lit at night, looks lovely from the backyard looking in. How many people will use it: Is the set for your family, extended family, friends? What shape do you prefer: oval, round, rectangle or square? Does that shape and size fit into the space you have in mind? Furniture that is oversized can dwarf an already small space. Likewise, furniture that is too small can look like it is floating or is lost in a larger space. Comfort: Are the dining chairs the primary seating for your outdoor space? If so, you might want to consider dining chairs with cushions. The chairs can serve double duty as seating near the pool or fire pit. Style: If you're starting from scratch—good for you. What style is your house, apartment or condo? Georgian, Craftsman or modern? None of the above? Look at your inside furnishings and what you like about them, then carry the look outdoors. Or surprise everyone—including yourself—and go with something unpredictable and completely opposite of what's happening indoors to change the look. Time to go outside and let down your proverbial hair. You're dining outside; it's informal. There's no hard-and-fast rule that the table must match the chairs and that all the chairs must match. Even Martha Stewart would probably give a thumbs-up to combining styles and types of chairs. Some seek out the look and consider it eclectic. Others have acquired numerous patio chairs and tables throughout the years or have a passion for vintage outdoor furnishings. If the swimming pool is well maintained and there is room, the effect of dining near the pool or a body of water can be calming and elegant. Water has a way of doing that. Just make sure to turn off the robotic cleaner and other noisy features that can kill the charm of the occasion. Adding effects like color-changing lights and pool fountains are little extras that will enhance your outdoor dining experience. If your indoor dining set is not heavy and extremely expensive or valuable, make the occasion special by pulling it outside, under a big tree. Dress up things with a tablecloth, centerpiece, and lighting. Make sure your furniture isn't too large for the designated outdoor space. Big, comfortable, deep-seating sets are popular but simply won't work if your guests don't have room to get in and out of their chairs or move around the table. Measure the space before you go shopping for dining furniture. Less, and sometimes smaller, is the smarter way to go. Do any of your guests use a wheelchair, walker, or cane? Be mindful and make necessary changes so that they can easily move around. This would include paths that are wide enough to accommodate a wheelchair, space around the table for a smooth entrance and exit, and level ground. Music: A little night music is always nice, especially something that allows guests to relax and talk. Centerpiece: something low, so guests can see one another over it. Pick something from the garden: flowers, foliage, a bowl of fruit or vegetables, maybe a nosegay of fresh herbs. Beverages: A martini, wine, beer, iced tea, or whatever your guests like. Don't know? Find out beforehand. Ah, the bugs of summer. Fireflies and ladybugs are welcome, but mosquitoes can pretty much ruin a nice evening outdoors. Citronella candles are decorative, provide light and can keep a limited number of biting bugs at bay. If you're fortunate to have or can buy a fountain, the moving water can repel some insects while freshening the air. Cover serving platters or individual plates with special net devices that fit over the dish. Some gazebos have mosquito netting-like curtains. Supply bug sprays for your guests, but apply it away from the dining table.